Posted on November 9, 2015 by Barry V.
Wherever I happened to be along the trails at Lincoln Woods Wildlife Sanctuary today, I was never out of earshot of the persistent “chuck-chuck-chuck” of Eastern Chipmunks. At no other time of the year are these attractive little rodents more vocal. I’ve been told that the “chuck” call is given by males defending a territory, so I tracked one down (by ear) and put a scope on the animal. 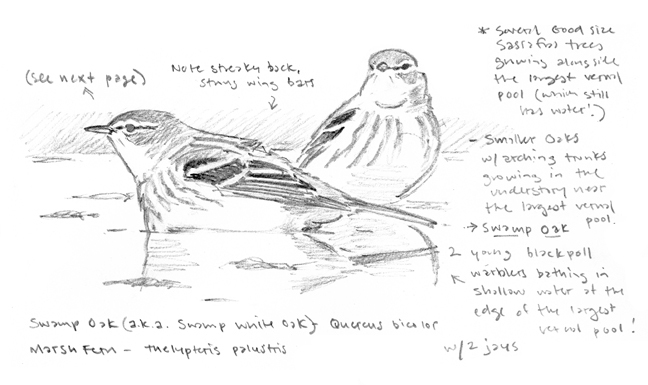 It occupied an inconspicuous perch on the forest floor and delivered it’s “chucks” at regular intervals, otherwise remaining quite still – a good model for drawing! My dad often used an expression to describe us kids when we got up early in the morning – “BRIGHT-EYED AND BUSHY-TAILED”. It’s a pretty good description of this little guy! The woods around the parking area in this urban neighborhood are a nearly unbroken stand of Norway maples. The ability of this tree to grow quickly and seed-in heavily allows it to out-compete native trees and form dense monocultures. As I head deeper into the woods, however, the Norway maples thin out and give way to native species. Heading out along the western side of the Elizabeth Lincoln Loop Trail, I pass through a stand of majestic white pines before the trail joins with Vernal Pool Loop. 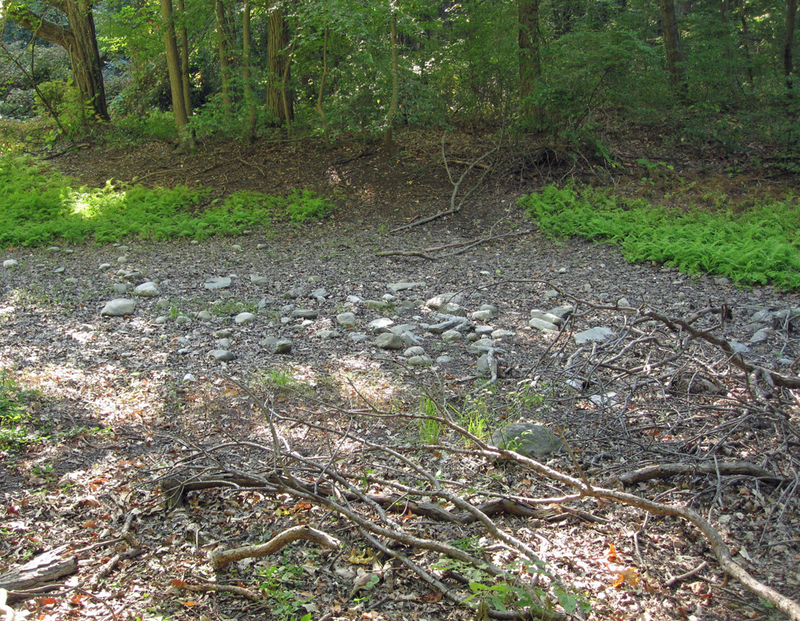 A series of vernal pools can be seen on either side of this elevated trail, which runs along a glacial esker ridge. 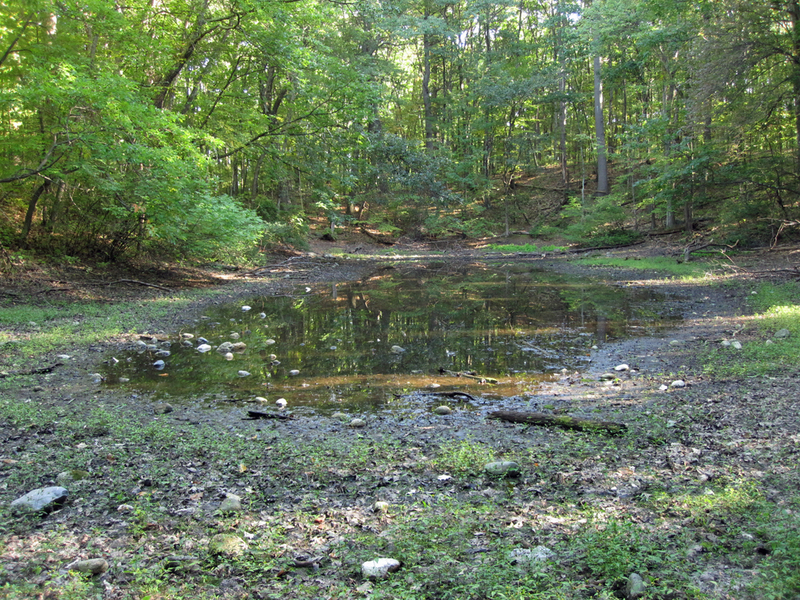 Most of the vernal pools are bone dry at this time of year, but two of the largest pools have some water in them. I wander down to the largest pool to get a closer look. Around the pool, I notice some interesting plants – marsh fern, swamp oak, sassafras, winterberry and dogwood. 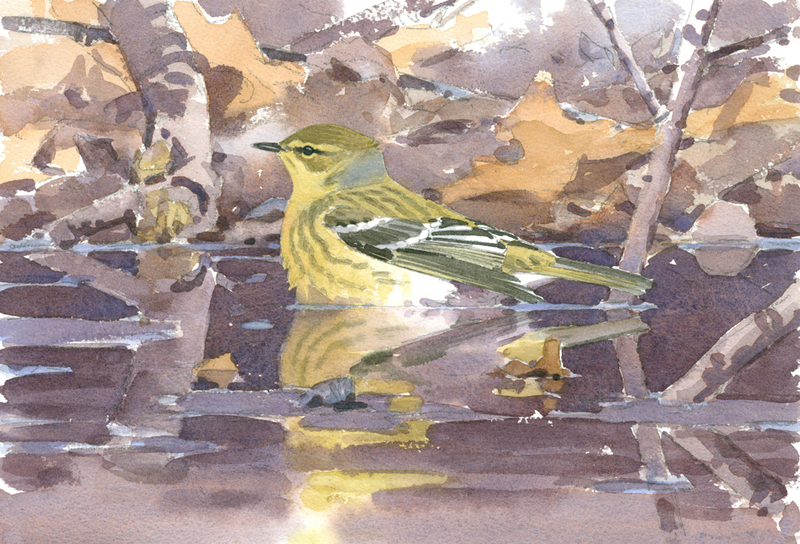 As I’m about to depart, a movement along the opposite shore catches my eye, and I focus my binoculars on two blackpoll warblers that have come to bath in the pool. The bright olive hue of the birds makes an unexpected contrast with the somber colors of the shoreline, and the bird’s reflections seem to glow on the dark waters. Within minutes the birds have moved on, and the pool is once again quiet and still. I make some quick sketches to fix the scene in my mind, and take some digital photos of the shoreline shapes and colors. I use these references to help me work up this studio watercolor the next day. 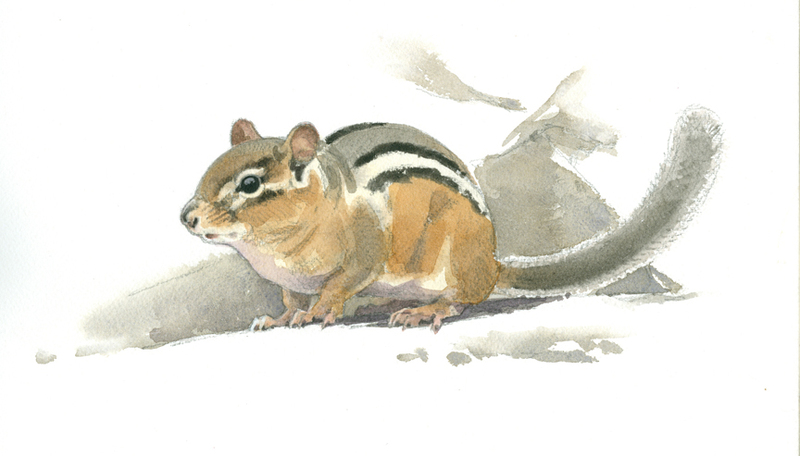 This entry was posted in Artists, Barry Van Dusen Residency, Museum, Natural History, News, Wildlife Sanctuary and tagged art, Artist, artist residency, Barry Van Dusen, blackpoll warbler, Chipmonk watercolor, dogwood, Eastern chipmonk, glacial esker ridge, Lincoln woods wildlife sanctuary, marsh fern, Museum of American Bird Art, Sassafras, Sketching, swamp oak, vernal pools, Watercolor, Wildlife Sanctuary, winterberry on November 9, 2015 by Barry V..